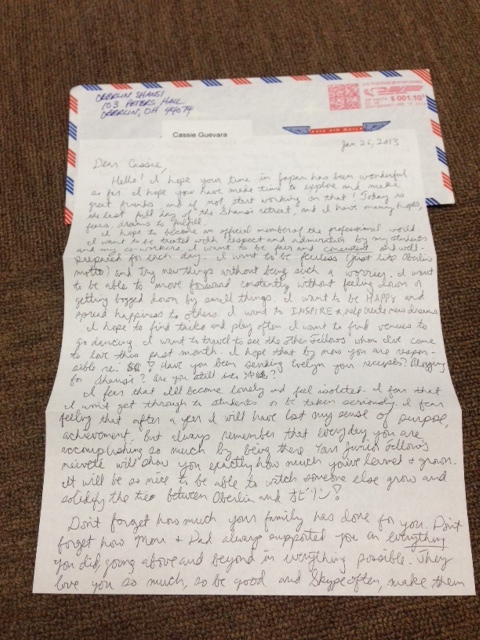 Today I was delighted and excited to see this letter in my mailbox from Oberlin Shansi. I had written it almost exactly a year ago at the end of the intensive month-long ESL/Shansi training session at Oberlin. (Oh, memories of Shansi House come flooding back.) It is quite an experience to read such a personal message, a written time capsule, from someone who knows me more than anyone else. As cheesy as some of the words sound, I could not have been more sincere at that time. I knew I’d be thrown into classes with unmotivated students, so I’d need 10x more of my usual energy, enthusiasm, and optimism to both impress them (or just keep their attention) and fight off any disillusionment. Now that I’m in my last few days of teaching for the semester, I can say that I kept surprisingly true to my goals that I set back then, though I certainly haven’t done enough dancing! Hello!I hope your time in Japan has been wonderful so far. I hope you have made time to explore and make great friends, and if not, start working on that! (*1) Today is the last full day of the Shansi retreat, and I have many hopes,fears, dreams to fulfill. I hope to find taiko and play often. I want to find venues to go dancing. (*5) I want to travel to see the other Fellows whom I’ve come to love this past month. (*6) I hope that by now you are responsible re: $$!! Have you been sending Evelyn your receipts? Blogging for Shansi? Are you still into 沖縄? I fear that I’ll become lonely and feel isolated. I fear that I won’t get through to students or be taken seriously. I fear feeling that after a year I will have lost my sense of purpose, achievement. But always remember that every day you are accomplishing so much by being there. Your Junior Fellow’s naivete will show you exactly how much you’ve learned and grown. (*7) It will be so nice to be able to watch someone else grow and solidify the tie between Oberlin and Oubirin! Don’t forget how much your family has done for you. Don’t forget how Mom and Dad always supported you in everything you did, going above and beyond in everything possible. They love you so much, so be good and Skype often, make them proud. Skype with Christian too and this time listen to what he has to say. Don’t get caught up in your own selfish world like last time (though of course, keep living it up!). Don’t forget Tita Agnes, T. Boy, Ate Alex, Ate Cris, and Ate Joy and how they all helped raise you and made you the woman you’ve become. They have taught you to respect yourself, make smart decisions, and stand up for what you think is right. (*8) Don’t forget about Oberlin, your home away from home, which has taught you to embody equality and justice. Right now, I am an idealistic college student. Despite what happens, always stay idealistic – never give up hope! (*9) Go out and live an amazing, fulfilling life ’til the end of your days. Also, don’t forget about Ken and how much he meant to you at this time. He really loves you now (Jan ’13) and you are lucky to have loved him. Stay vigilant. Keep up with the news and try reading when you can. Keep in touch with friends and family. Earn your respect. Go above and beyond. Do more than you thought you ever could. 1. The feelings of friendless-ness and isolation were painfully real during my first few months. Almost every day I would think to myself, “With this kind of job, and in this location, how exactly can I go about making more friends?” Toward the middle of November I finally started meeting and hanging out with more people, therefore breaking out of my mostly-English-speaking bubble. 2. I can’t say that I was very consistent in my first few months of teaching. As I was still experimenting with various activities, methods, approaches, games, I was very “tekitou” （適当）, often changing things to be more suitable to each class’s personality, and sometimes just barely pulling things together in time for class. 3. Anabel and Lissette can tell you that I am definitely still a worrier. In most cases. 4. I was most worried (ah, worrying again) about if I would have any impact at all on some of my students.. but some letters I received on my last day of Class 80 reassured me that somehow they “had a lot of fun”, “really liked [my] class”, “made a lot of friends”, and “learned a lot”. Some expressed that my stories about America and my latest visit to Australia made them want to go abroad. Perhaps my first essay topic, which asked them to describe a dream vacation in a foreign country* (that they had to research (Google) about) helped with that too. 5. Taiko was one of my first priorities since coming here, and I am now going every week to a class at the “Oedo Sukeroku Daiko Dojo” in Ochanomizu, Tokyo. I am definitely not doing enough dancing, but hope to start going to swing dancing events once in a while after my long spring break! 6. I’ll be getting to meet up with a ton of the other Shansi Fellows (both junior fellows from my year, and senior fellows) in Indonesia (Feb 9~) and China (end of March)! I’m so excited! 7. This was basically taken from the Shansi Orientation handbook. Hehe, “naivete”. 8. Being away from family is one of the hardest parts about living and working in Japan. I have often thought about staying in Japan after Shansi, but this issue is one of the few things that gives me pause. 9. In this case, I was thinking about all the English teachers I have seen in Japan who are completely defeated by their students apathy and become completely apathetic themselves. I don’t know if it has worked this semester, but I want to be an English teacher these students remember, one who made them see the benefits of knowing two languages, or exposed them to parts of the world they hadn’t stopped to think about before.